Registration waivers available for new schools! Click on "Latest WSO NEWS!" link above for more info. 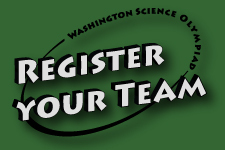 You've found the home for Washington Science Olympiad (WSO). The Board of Directors wish to welcome you to our state site, which is part of the national Science Olympiad program. Each year we strive to increase the quality of K-12 science education by providing learning opportunities and hosting regional and state tournaments. 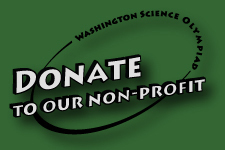 We're looking forward to another great year of helping to improve science education throughout Washington state. Currently, more than 160 middle and high schools representing over 3,000 students in Washington are participating in the WSO. In 2018 alone, WSO had over 1,000 volunteers involved in reaching middle and high school students for science. The challenging and motivating events of WSO align with the Washington State Learning Standards as well as the National Science Education Standards. The events are designed to enhance and strengthen both science content and process skills. The National Science Education Standards hails Science Olympiad as an example that “illustrates the close relationship between teaching and assessment. The assessment tasks are developmentally appropriate for young children, including recognition of students’ physical skills and cognitive abilities” (NRC, 1996, p 39). 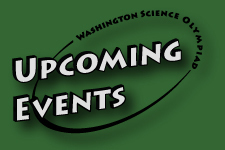 Our newsletters, WSO News, provide an excellent source for the latest information on Washington Science Olympiad. There are many ways to become involved in Science Olympiad - Coach a team, judge an event, direct a tournament, compete on your school team, serve on the Board of Directors, donate your time, contribute funds. No matter which way(s) you decide to become involved, do it now! Since Science Olympiad relies on volunteers to run the organization and tournaments we need your support. Contact the state director to see how you can find out more about getting involved in Science Olympiad. Copyright ©2007 Sam Buzby Design, Inc., All Rights reserved.